ACA’s Joan James Harris Theater. Free – public invited. For more information please call (386) 427-6975. Grabner holds an MA in Art History and a BFA in Painting and Drawing from the University of Wisconsin–Milwaukee, and an MFA in Art Theory and Practice from Northwestern University. She joined the faculty of the School of the Art Institute of Chicago in 1996 and became Chair of its prestigious Painting and Drawing department in the fall of 2009. 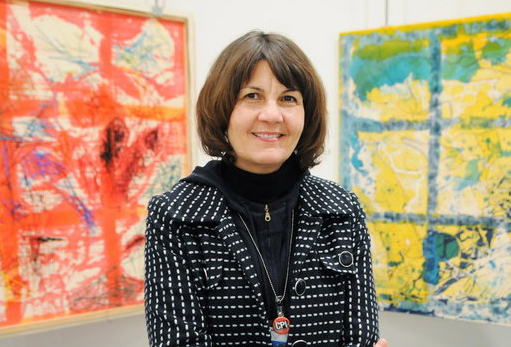 She is also a senior critic at Yale University in the Department of Painting and Printmaking. Her writing has been published in Artforum, Modern Painters, Frieze, Art Press, and Art-Agenda, among others. Grabner also runs The Suburban and The Poor Farm with her husband, artist Brad Killam. She co-curated the 2014 Whitney Biennial at the Whitney Museum of American Art along with Anthony Elms and Stuart Comer. Grabner is the artistic director of FRONT, a triennial exhibition in Cleveland, OH and the vicinity opening in July 2018. I Work From Home, Michelle Grabner’s first comprehensive solo museum exhibition at the Museum of Contemporary Art, Cleveland organized by David Norr opened in October of 2013 and was on view through February, 2014. She was the subject of a solo exhibition at the Indianapolis Museum of Art curated by Tricia Paik in May 2015. Solo exhibitions of her work have also been held at INOVA, The University of Wisconsin, Milwaukee; Ulrich Museum, Wichita; and University Galleries, Illinois State University. She has been included in group exhibitions at Museum of Contemporary Art, Chicago; Walker Art Center, Minneapolis; Tate St. Ives, UK; and Kunsthalle Bern, Switzerland. Her work is included in the permanent collection of Walker Art Center, Minneapolis; MoCA, Chicago; MUDAM, Luxemburg; Milwaukee Art Museum, Wisconsin; Madison Museum of Contemporary Art, Wisconsin; Daimler Contemporary, Berlin; Smithsonian American Art Museum, Washington DC and the Victoria and Albert Museum, London.